Much to my surprise I discovered that the full build number for a Windows OS is not stored in WMI in the usual Win32_OperatingSystem class. 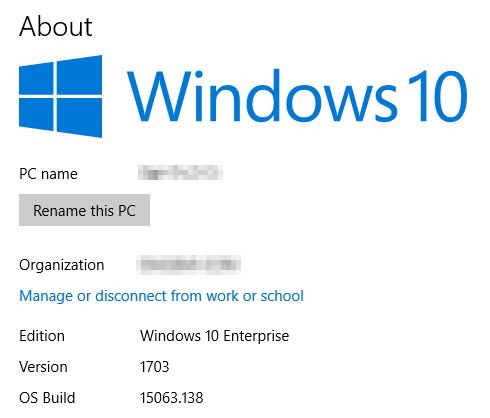 In Windows 10 at least, the full build number containing the “UBR”, or essentially the CU patch level of the build, is a useful piece of information. To find the full number I have to query the registry in the HKEY_LOCAL_MACHINE\SOFTWARE\Microsoft\Windows NT\CurrentVersion branch. So I put together a PowerShell script that can be used to get the Windows version for a local or remote computer (or group of computers) which includes the Edition, Version and full OS Build values. Wauw, beside your nice script, this must be the coolest .net class I’ve ever seen System.Data.DataTable Many Thanks for that, nice and easy way to create objects..I guess better than the hashtables everyone knows about to create PCCustomobjects…or which one is in your opinion more a favorite? Thanks, hashtables are perfectly cool too 🙂 I often query SQL data so I’m in the habit of using the datatable format, but it works quite well for general use too. What am I missing here? I can run the script and return the local computers value. But, I can’t seem to figure out how to return remote system values and groups of remote system values. ^ required on line one for the script to work properly with the command indicated. Maybe this was implied? I had to ask IRC to get this information. I hope this helps anyone else trying to use the script. Ah, makes sense, cool thank you. Hey Paul. I’m trying the same thing you are, but cant seem to figure out what you mean above. Can you post the modified script for remote users? Thanks, how can we modify it for text inputs?